Tribal braids have become a sort of colloquial term for many popular braiding styles that have origins in Africa. 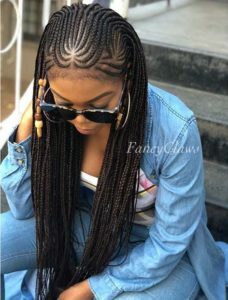 The most common styles that go by the name of “tribal braids” are actually Fulani braids, but the term can also be used to describe a variety of other styles, many of which feature beads and other adornments. Tribal braids can be created with or without added braiding hair. 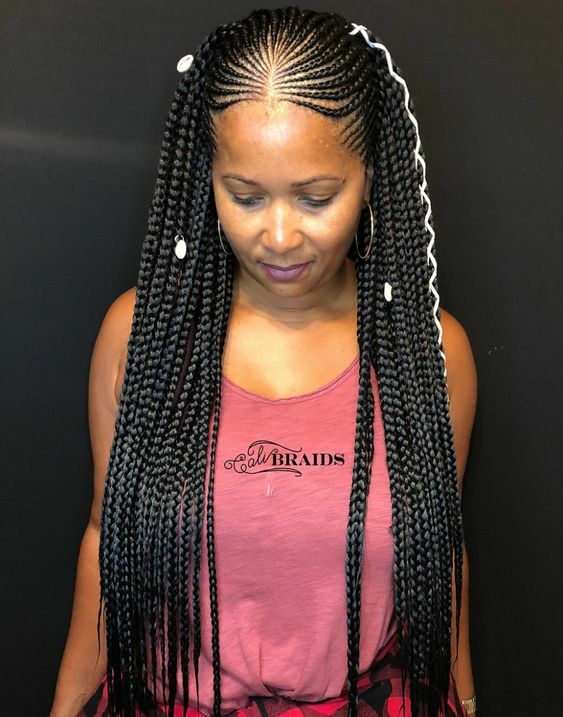 If you’re looking for a protective style that’s timeless and beautiful with a rich history, tribal braids are a great option. 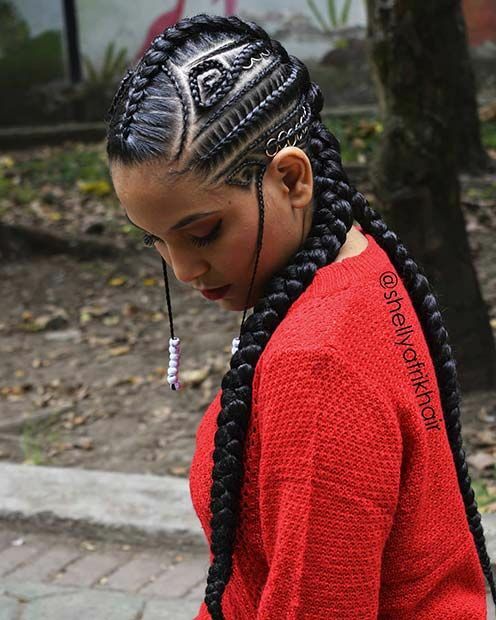 Here are 35 wonderful tribal braid styles to inspire your next look. These ultra-long braids are a great example of classic tribal braids. Add some gold beads and colored cord to help embellish this already beautiful style that’s fit for a goddess. 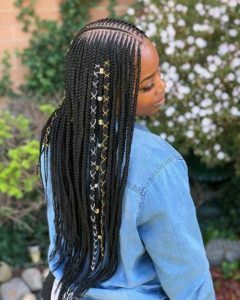 These striking black and blonde tribal braids are adorned with beads that coordinate with the two-toned color of the hair. This is an absolutely stunning choice for your next protective style. 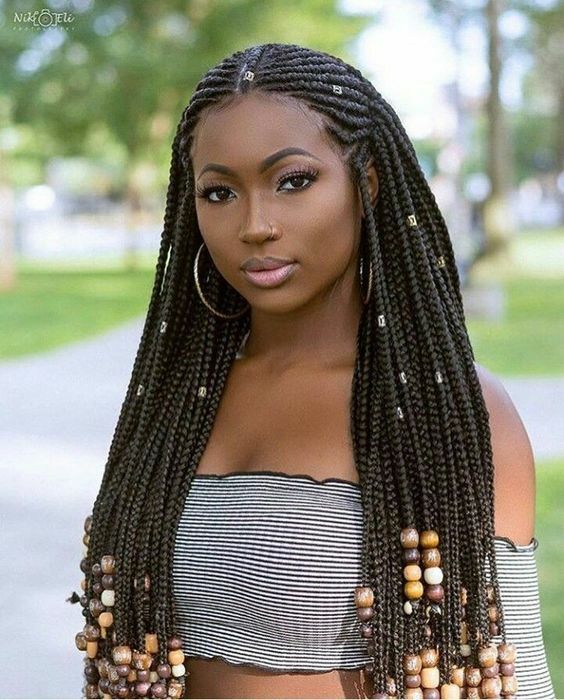 These brown tribal braids are adorned with wooden beads on the ends. This is a style that’s been around forever, but it always has a classic, timeless appeal that never makes it feel dated. 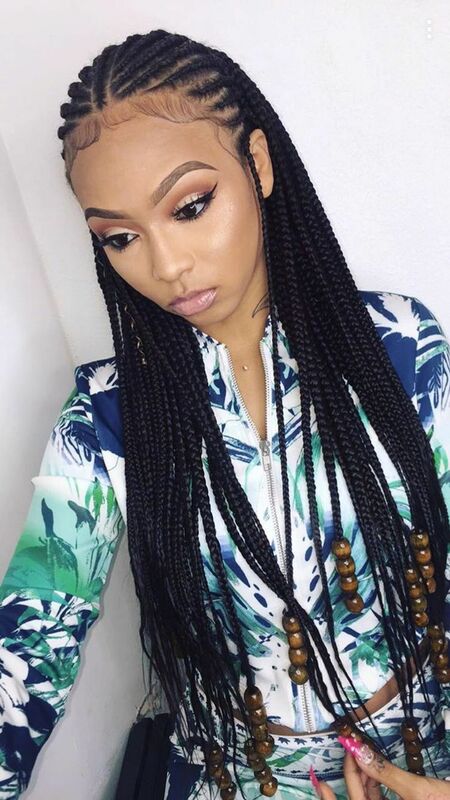 This is a classic tribal braids style that shows off the beauty of natural hair. Simple but gorgeous, this style is a great option if you like a low maintenance braided style that’s timeless yet modern. 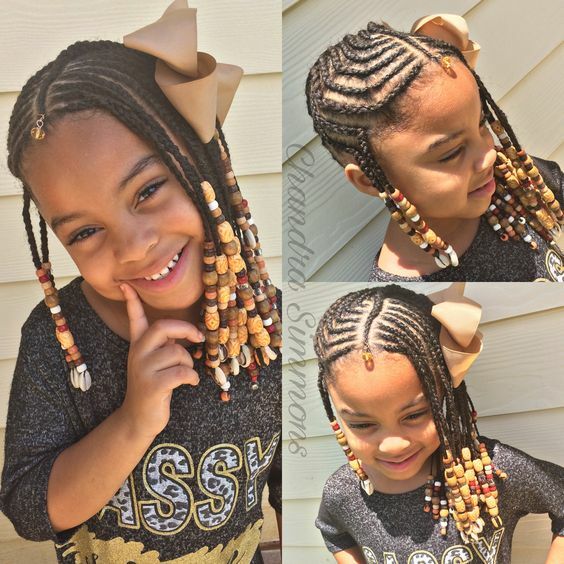 Here’s a great tribal braids style for the little one in your life. 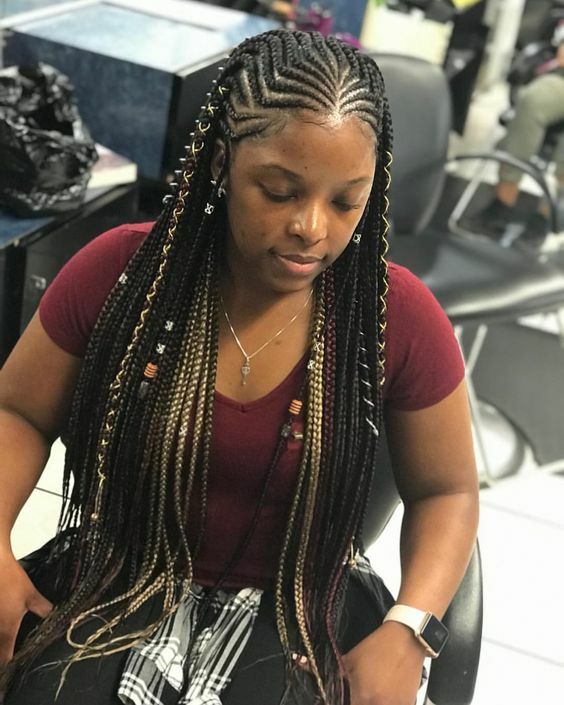 Adorned with wooden beads, this style can be created with or without added braiding hair. Add a large bow to give this style a youthful look. These stunning tribal braids are adorned with silver jewelry, adding an extra touch of elegance to an already regal style. 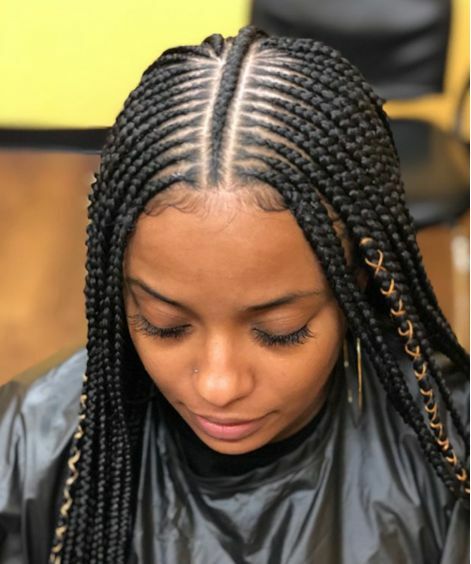 Braided bangs are always a fun look. 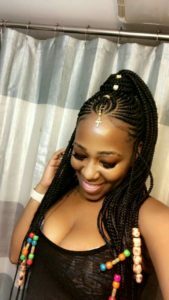 These beautiful tribal braids are also adorned with beads, a look that experiences a surge in popularity every so often, but never really goes out of style because it’s so timeless. These pretty blonde tribal braids make for an ideal summertime protective style. Whether you’re lounging on the beach, relaxing poolside, or spending the day at an outdoor festival, these braids will keep you looking stylish. If you’re looking for a bold look that really makes a statement, look no further than these gorgeous blue tribal braids. Getting braids is a perfect way to temporarily rock a new hair color without the long-term commitment. 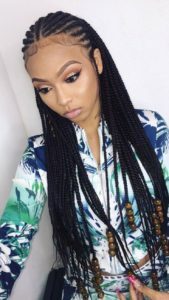 These tribal braids are styled into a chic half up half down style. 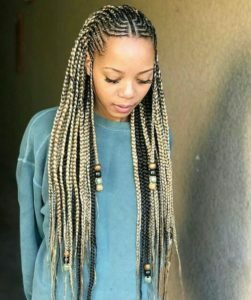 Another fun way to experiment with color, these pretty tribal braids are streaked with blonde, for a slightly more subtle pop of color. The two-toned effect will help give you a sun-kissed look no matter what time of year it may be. 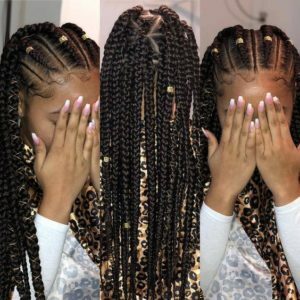 If you want a style that’s more out of the ordinary, these multi-sized and multi-directional tribal braids may be right up your alley. 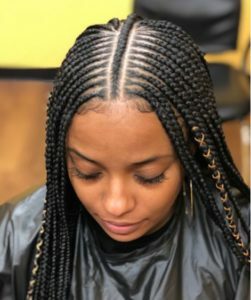 The meticulous braid pattern results in an absolutely beautiful and unique look. These beautiful classic tribal braids are adorned with hair jewelry and a single cowrie shell. 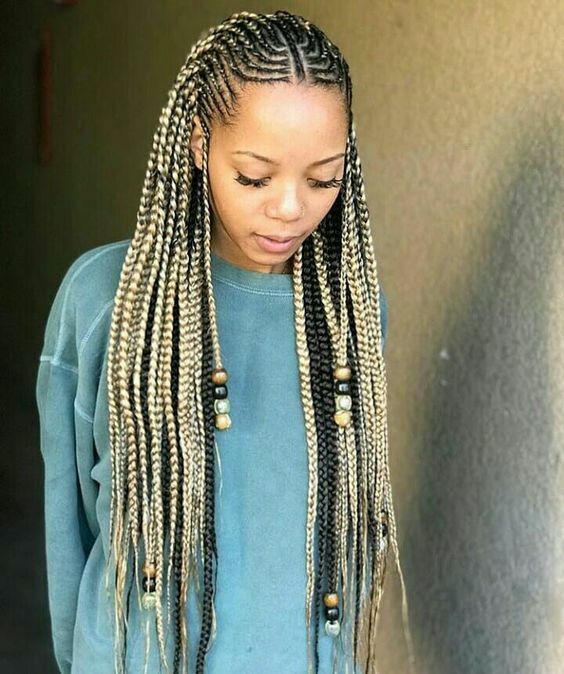 Blonde ombre color gives this style a modern look while still maintaining the traditional look of tribal braids. 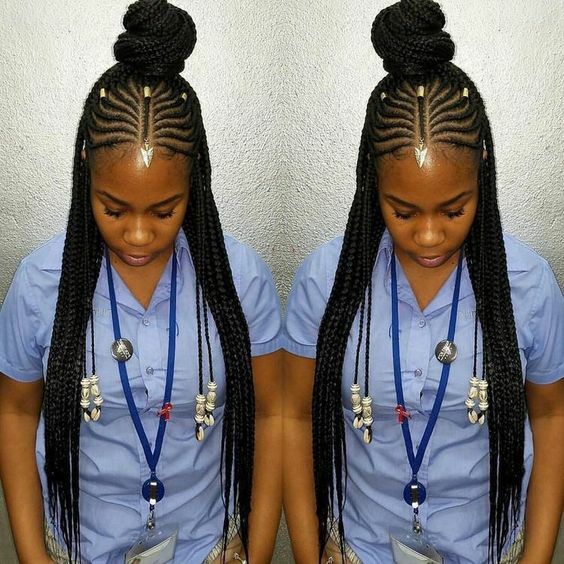 These gorgeous tribal braids feature an intricate, multi-directional braid pattern. 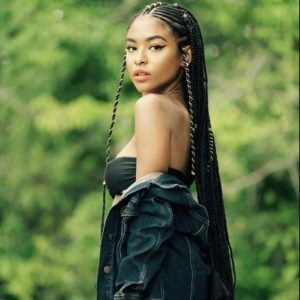 As you can see, these braids can be styled in several ways: down, in half up double buns, and in a half up high bun, just to name a few. 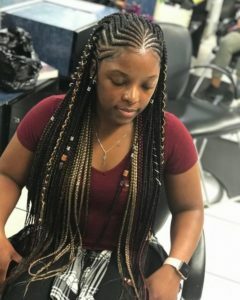 A combination of black, light brown, and blonde braiding hair is used to create these gorgeous multi-colored tribal braids. The striking color combo really makes this style pop. Cowrie shells have a rich and varied history; they were once considered so valuable, they were used as currency in some parts of Africa. Today, they’ve become a popular hair accessory for many braided styles, like these beautiful tribal braids, helping to keep their rich legacy alive. 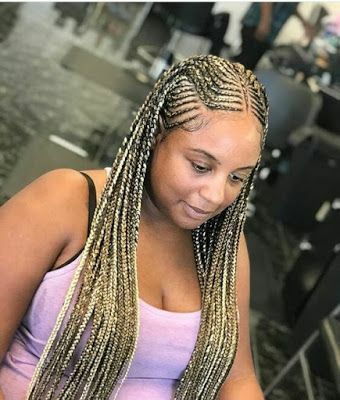 If you want a protective style that’s simple and easy to maintain but still beautiful, consider these middle parted tribal braids. 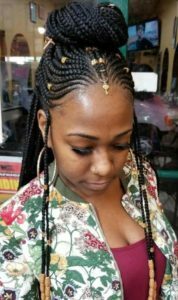 Their long length give you the versatility to style them several different ways. 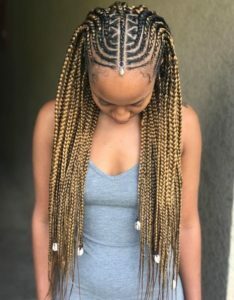 These pretty two-toned tribal braids feature a simple zig-zag braid pattern and are adorned with beads and cord. Hair accessories give you the freedom to personalize even the most popular styles, giving them a little of your own unique flair. 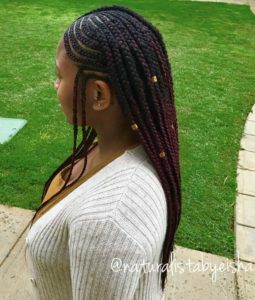 These gorgeous tribal braids feature a single cornrow down the middle of the head. 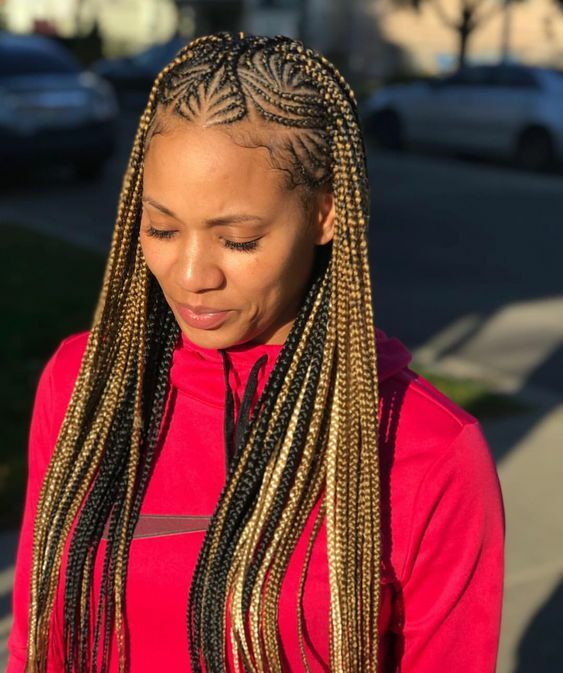 The braids are accessorized with gold beads and silver and gold cord, giving them a regal look. 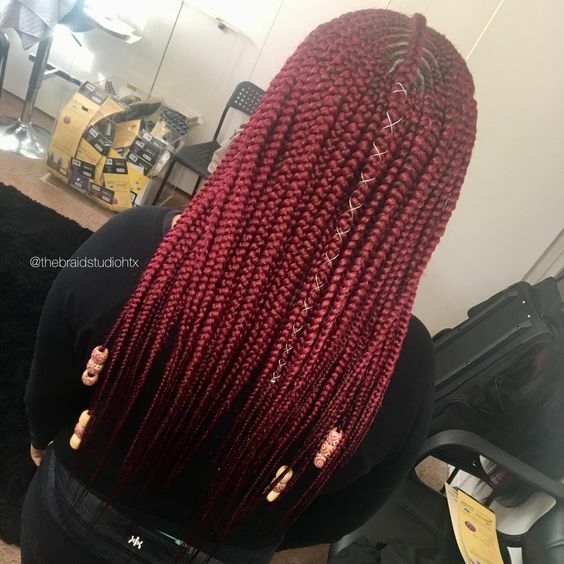 These beautiful red tribal braids are perfect for those who want to make a bold statement. Adorned with wooden beads and colored cord, the rich red color helps emphasize the pretty braid pattern at the crown of the head. There’s no limit to the ways you can jazz up any style with a little hair jewelry. 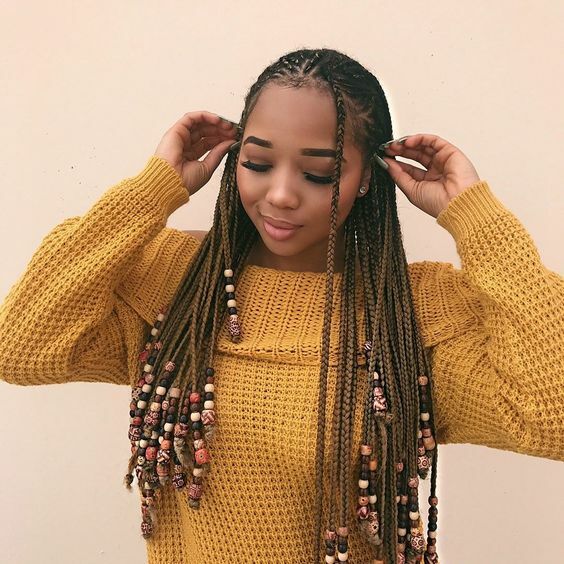 Beads and rings give these tribal braids a little extra flair. Style the braids into a cute half up bun like the one pictured here. 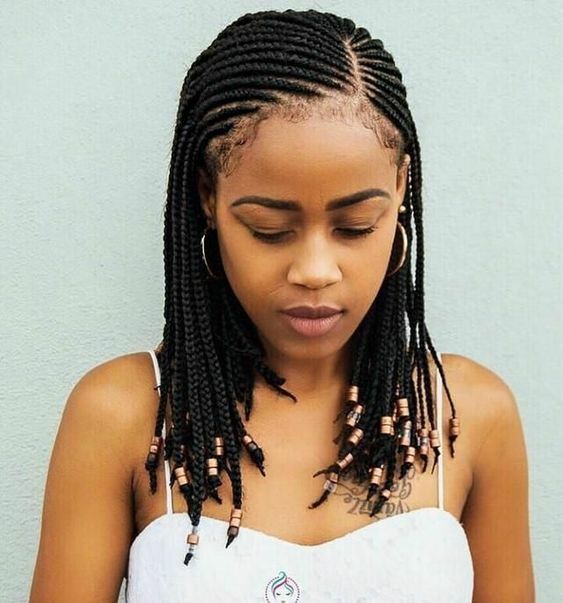 These simple, middle-parted tribal braids prove that sometimes less is more. These braids are gorgeous on their own: hair accessories and intricate styles are totally optional. These pretty red ombre tribal braids are perfect for those who want to rock a color that’s subtle and understated. Add a few gold beads to help the dark red color really pop. 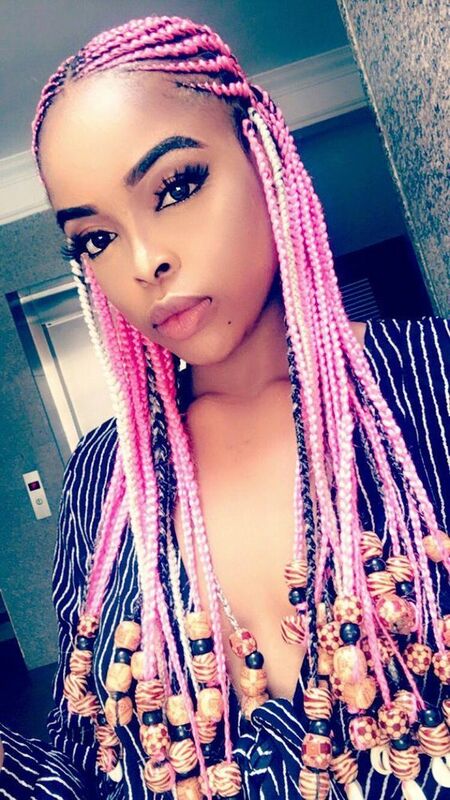 If you want a fun, bold look, these pretty cotton candy pink tribal braids are a great option. Add some colorful beads for even more flair. These pretty tribal braids feature a side part and copper-colored beads on the ends. 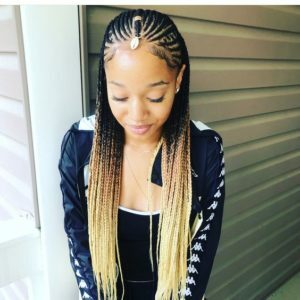 This is a great length for those who aren’t accustomed to wearing ultra-long braids. 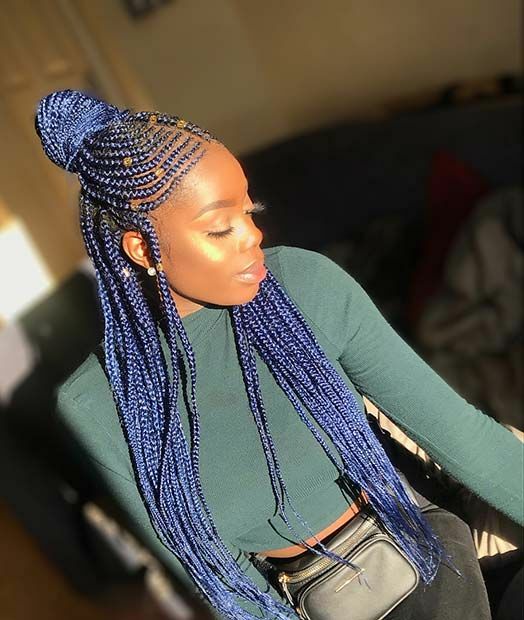 You don’t even have to add braiding hair if you don’t want to – but if you want extra protection and longevity, using braiding hair is still a good option. 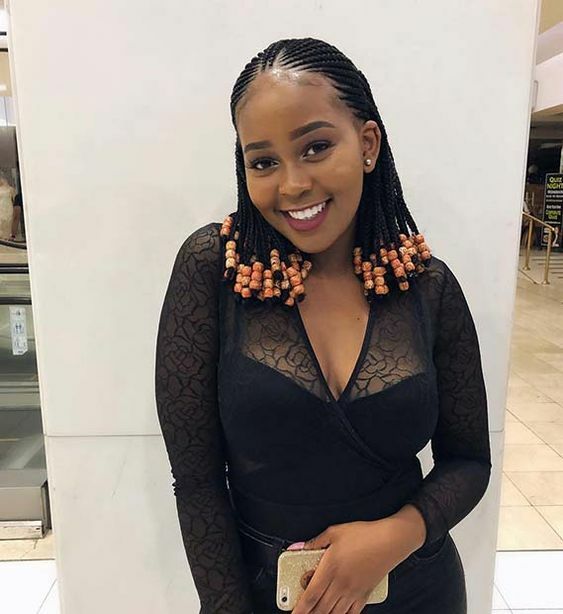 Here’s another gorgeous style featuring cowrie shells. 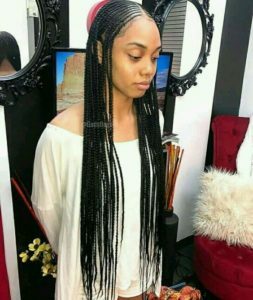 These hip-length tribal braids are also adorned with white cord which helps bring out the shiny black color of the hair. 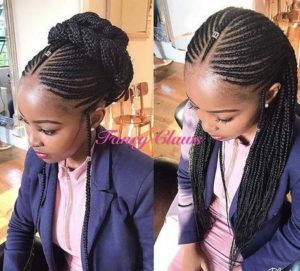 Here’s a great example of just how versatile tribal braids can be. 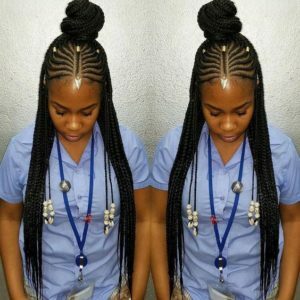 These braids look great down or styled into a chic updo. 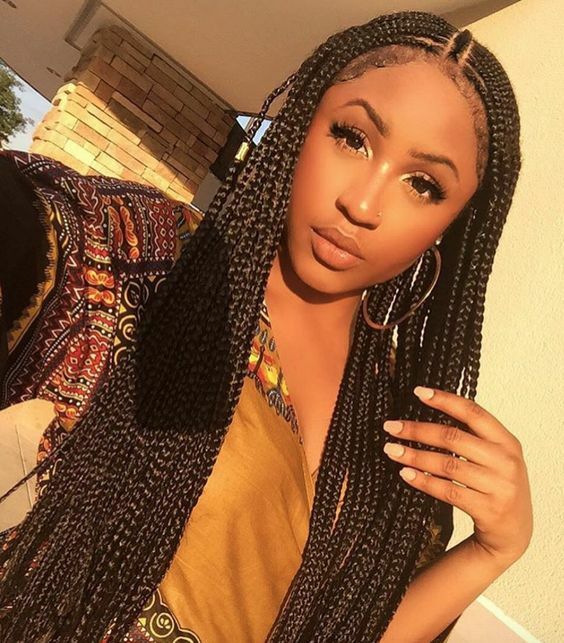 Either way, these pretty tribal braids are fit for a queen. 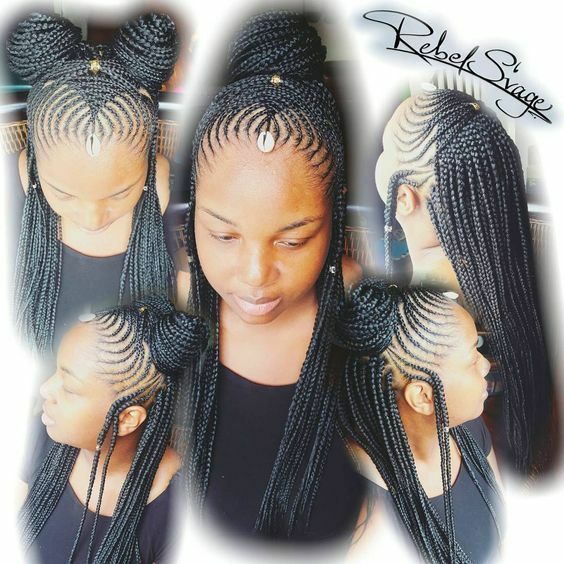 These gorgeous tribal braids are parted in the middle with the help of a single braid down the center of the head. The braids are then accessorized with bronze cord. If you prefer shorter braids, then these gorgeous beaded tribal braids are just right for you. 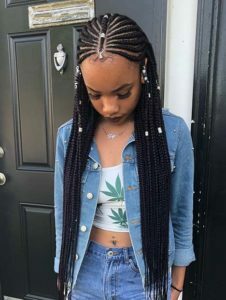 This style can be done using just your natural hair, or with the addition of braiding hair. 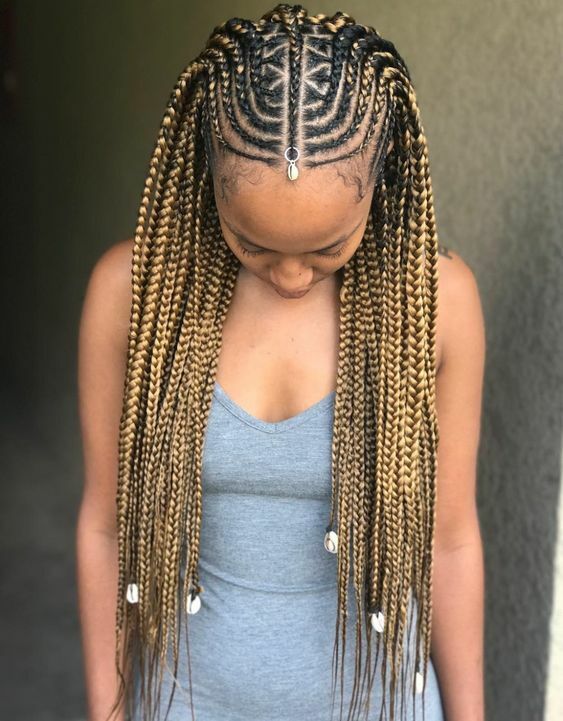 These tribal braids feature an intricate braid pattern in the front, giving them a unique look. Add a few wooden beads to frame the face and finish off the look. 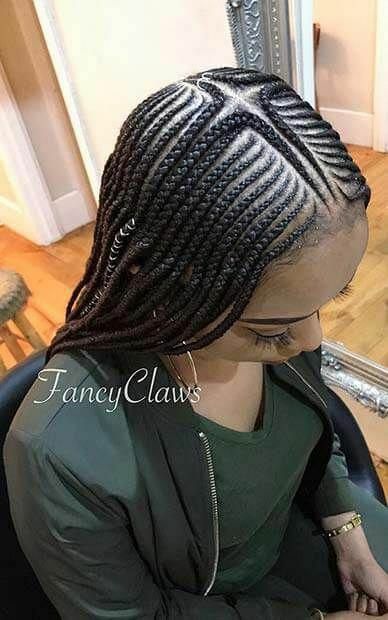 These tribal braids feature a distinctive braid pattern that divides the hair into four sections. Dress this style up by adding a little hair jewelry and/or colored cord. These pretty, hip-length tribal braids are adorned with wooden beads on the ends. 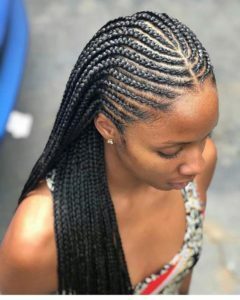 If you’re worried about too many beads weighing your hair down, don’t feel obligated to add them to every single braid. 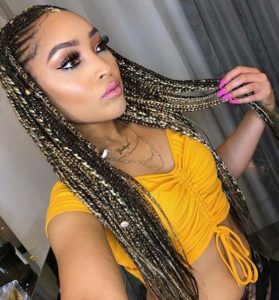 This unique style combines the look of tribal braids with box braids for a fresh new look that’s sure to get lots of compliments. These gorgeous tribal braids are accessorized with both silver and wooden beads; add the wooden beads to the ends and arrange the silver ones up and down the length of the braids for a unique effect. These pretty tribal braids are styled into a chic high ponytail and adorned with gold hair jewelry and multi-colored beads. Just another example of how easily you can customize your next look with the help of hair accessories. 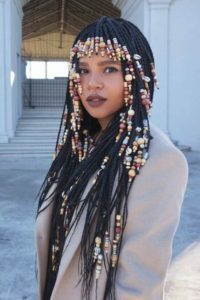 These pretty hip-length tribal braids are accessorized with hair jewelry, beads, and cowrie shells. The braids are arranged in a simple but cute half up high bun, allowing the rest of the hair to hang over the shoulders. 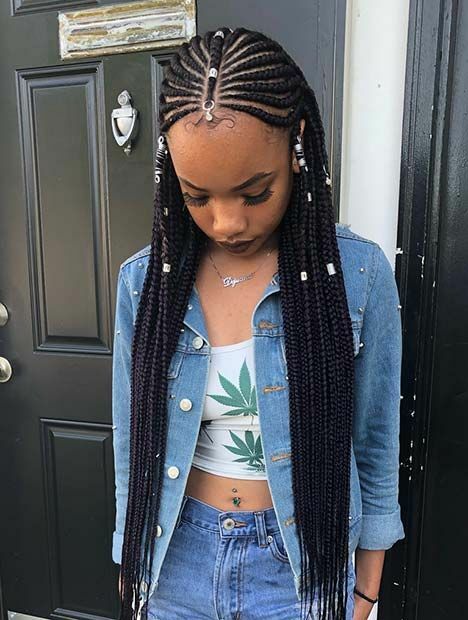 The length of these braids allows you to style them in several different ways.